One good tour deserves another. 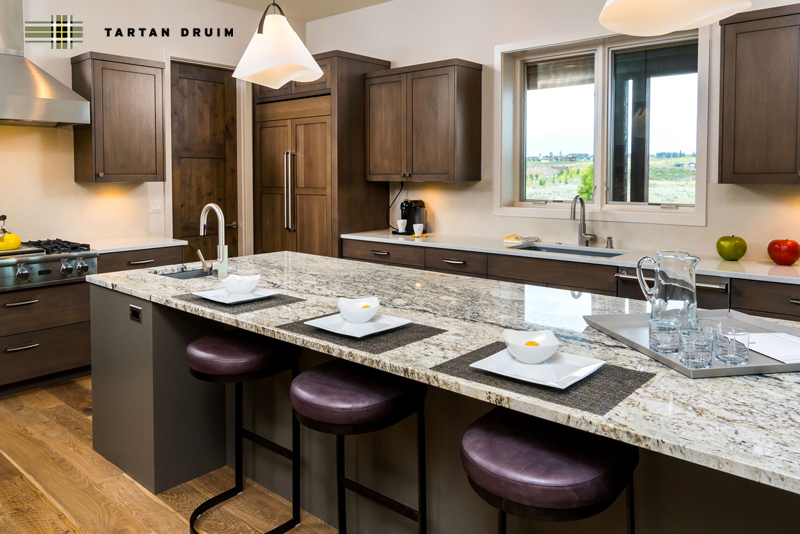 Just in time for summer, the Tartan Druim model home is open and ready for its close-up. And we’re excited to give you two delectable opportunities to see it for yourself. First, Tartan Druim will be featured on the 4th Annual Chefs on Tour, presented by Central Oregon Builders Association (COBA) on Wednesday, July 13. Chefs on Tour offers a unique way to experience Bend’s exceptional cuisine in some of its most exquisite kitchens. This year, guests are invited to visit nine different homes, all located just a few minutes apart. In Tartan Druim’s spectacular kitchen, award-winning Chef Baltazar Chavez of Baltazar’s will be serving up his delicioso chicken and steak taquitos, shrimp cocktail, fresh guacamole and chips, ceviche with shrimp, and seafood-stuffed mushrooms. To compliment the menu, we will be pouring glasses of Knotty Blonde from Three Creeks Brewing. All in all, it’s a perfect way to get a good look at Arrowood Development’s highly anticipated new model before the Tour of Homes begins. Tickets for Chefs on Tour cost $39 and are very limited. Call COBA at 541-389-1058 or email nicolem@coba.org immediately to secure yours. If Chef’s on Tour isn’t in your plans, the annual Tour of Homes will give you six days of free viewing opportunities, Fridays from 12:00-6:00 pm and Saturdays & Sundays from 10:00 am – 6:00 pm. You’ll also be able to check out dozens of other new homes, including our magnificent model homes at Tripleknot Townhomes in Tetherow and at PointsWest Townhomes near the Seventh Mountain Resort. Either way you see Tartan Druim, you’ll know instantly what a special neighborhood of single-family homes it is destined be. Offering stunning views of the Cascades as well as David McLay Kidd’s award-winning links-style course, Tartan Druim is a neighborhood for those who don’t believe in compromises. In Phase I, a variety of one- and two-story homes will capture the essence of Bend’s relaxed Northwest lifestyle and adventurous spirit. With 20 homesites ranging from just under ½ to over ¾ of an acre, you’ll have plenty of breathing room, as well as easy access to endless recreation. Don’t miss your chance to be among the first to see Tartan Druim next week. After Chefs on Tour and the Tour of Homes, it will be the property on everyone’s lips. Prices starting in the low $1,000,000s.